Lock in a great price for Holiday Inn Aberdeen West – rated 9 by recent guests! Opposite a shopping Centre which had restaurants and take away food and supermarket. Very friendly helpful staff. Pleasant room. Comfortable beds. Nice restaurant, very varied menu, good food, good breakfast. Good location for our needs. Clean, well presented, absolutely loved the function room. Good size rooms and bathroom, very comfortable stay. Service good but slow in the Dining Room ....extra staff required when extra busy. Breakfast was definitely value for money. Loved that our two dogs could accompany us without charge - so much appreciated. Loved the proximity to the park to walk the dogs. Also local shops and takeways. Great breakfast. Location perfect for my meeting, and with a variety of shops and supermarkets within walking distance. Bathroom was huge and very modern. TV in the room was massive, and bed very comfortable. The gym was an added surprise and was free to use. Nice staff...really comfy bed...great breakfast and ideal location if visiting westhill . Very reasonable price and only £5 each for breakfast. Location ideal for what we were doing. Also there was a restaurant on site & the food was very good. 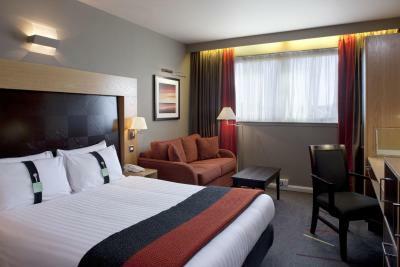 Holiday Inn Aberdeen West This rating is a reflection of how the property compares to the industry standard when it comes to price, facilities and services available. It's based on a self-evaluation by the property. Use this rating to help choose your stay! A 10-minute drive from Aberdeen city center and Aberdeen International Airport, this modern and stylish hotel offers the best and latest in Holiday Inn standards and facilities. The hotel served 24-hour food and drinks 24-hours a day. There is Luigi's Italian restaurant, the relaxing Glentanar lounge bar, Scots Corner themed bar, 24-hour room service and a full conference and banqueting facility. The hotel also has a gym, sauna facility and beauty salon. 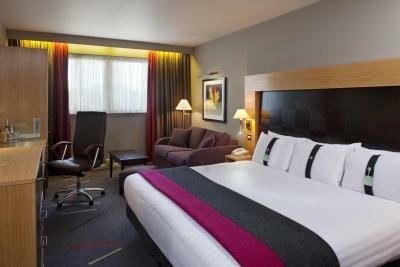 When would you like to stay at Holiday Inn Aberdeen West? 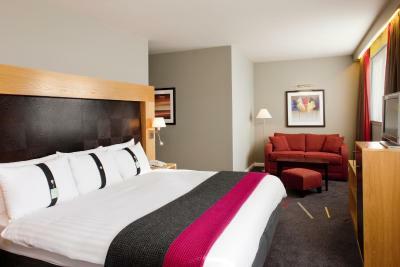 Additional amenities include a desk with a flat-screen TV and in-room safe. The private bathrooms contain a bath and shower, and toiletries. This room features a separate living area and a work desk with tea/coffee making facilities and a safe. Guests will find a shower and bath, as well as free toiletries and a hairdryer in the private bathrooms. This double room features a desk with a flat-screen TV and a safe. The private bathrooms contain a bath and shower, a hairdryer and complimentary toiletries. House Rules Holiday Inn Aberdeen West takes special requests – add in the next step! Holiday Inn Aberdeen West accepts these cards and reserves the right to temporarily hold an amount prior to arrival. Don’t like shampoo/conditioner/shower gel as one. View from room was onto flat roof with rubbish accumulated on it. As we were not "on holiday" but doing a family visit it was not an issue but I would try to get a different room next time. Air con automatically turns on when you put the card in and is noisy. Various random noises coming from air con system/pipework or something which weren't great. Situation was perfect for us to visit Westhill. Air conditioning was a bit loud. Room was very dark and would suggest brighter lights/centre light. Restaurant staff dropped part of one meal on floor and would have thought a reduction of some sort could have been offered in either offering a small discount or dessert. Hot water was non existent and couldn't have a bath or shower. When we arrived the hotel had no notification of our booking through Booking.com, luckily they had rooms available.